If you’re out and about and really want something quick to eat, it’s easy to just nip into the local takeaway or newsagents to pick up a snack to keep you going. There are hundreds of different quick snack options if you are feeling peckish, but some are definitely better for you than others. Fancy A Quick Sweet Treat? Well, the obvious quick snack foods for if you are on the go are fruity ones. Go prepared and take nature’s most obvious snacks with you. A banana is easy to fit into a handbag and ideal for perking you up. 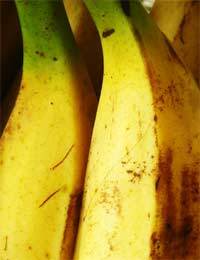 Bananas are high in energy and if you feel like your blood sugar levels are dropping, can be an ideal way of refuelling. They are also good pre-workout snacks. Apples and oranges don’t provide such an instant high energy fix as a banana, but are perfect portable snacks, especially satsumas and easy peel citrus fruit. Dried fruit makes up another one of your five a day fruit and vegetable portions, so if you have a bit of a nibble on, you could opt for a quick bag of dried apricots or raisins. There are plenty of great fruits and nut snack mixes to choose from now, but be aware that if you decide to choose anything chocolate or yoghurt coated the calorie and fat count will rise substantially. And dried banana chips are delicious but don’t eat too many –they usually have oil added to them and this puts the fat content right up. If you don’t have much of a sweet tooth but you’re in the mood for something savoury to keep you going instead, you could try some unsalted, natural nuts. Nuts have an unfair reputation for being fatty, and while most nuts do contain a fair bit of fat, it’s the healthy, unsaturated kind which many of us don’t get enough of. Don’t overdo the nut fix, but feel free to indulge. They also offer a high dose of protein which can keep you feeling full for longer. If you’ve had time to prepare food at home, you could make yourself a bag of crunchy vegetable sticks and take then with a dip like hummus, if you’re going to be able to snack at work. Carrots, celery, pepper and even some plain bread sticks will keep you going while giving you a quick burst of energy and vitamins. Make your own tortilla style crunchy bites by toasting pitta breads with salt and spices under a hot grill until they are crispy. These also make great dipping snacks, but you can enjoy them on their own with different herb and spice combinations too. Popcorn is another great idea which can be customised to a sweet or savoury taste, pop your own in the microwave and add natural flavours for a snack that feels like it should be decadent but in fact is low in fat and calories, and high in fibre too. With a little preparation, you can always have a healthy, tasty quick snack to hand to ward off the munchies!